Since I recently watched The Hobbit: The Desolation of Smaug , I would like to make a post inspired by the beautiful scenery of the movie. With only one exception namely; this being a real place. 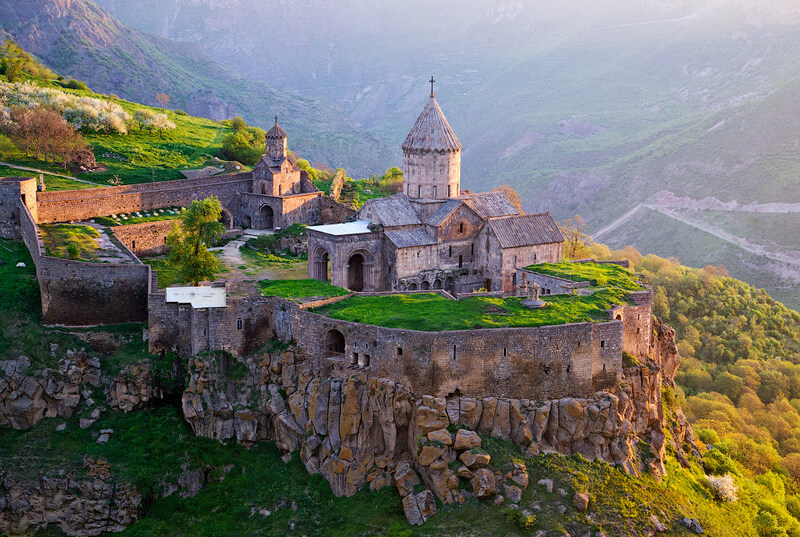 Monastery of Tatev, 8th century. The Tatev Monastery is an 8th-century monastery located on a large basalt plateau near the Tatev village in Syunik Province in southeastern Armenia. Build on an ancient pagan warship sight, the monastic ensemble stands on the edge of a deep gorge of the Vorotan River. Tatev is known as the bishopric seat of Syunik and played a significant role in the history of the region as a center of economic, political, spiritual and cultural activity. Many legends envelop Tatev. Why the name of the monastery ‘Ta Tev’ is translated as ‘Give me the wings’ from Old Armenian? Why does the oldest seismograph in the world, Gavazan Column, being 26.24 ft high keep swinging and does not fall? 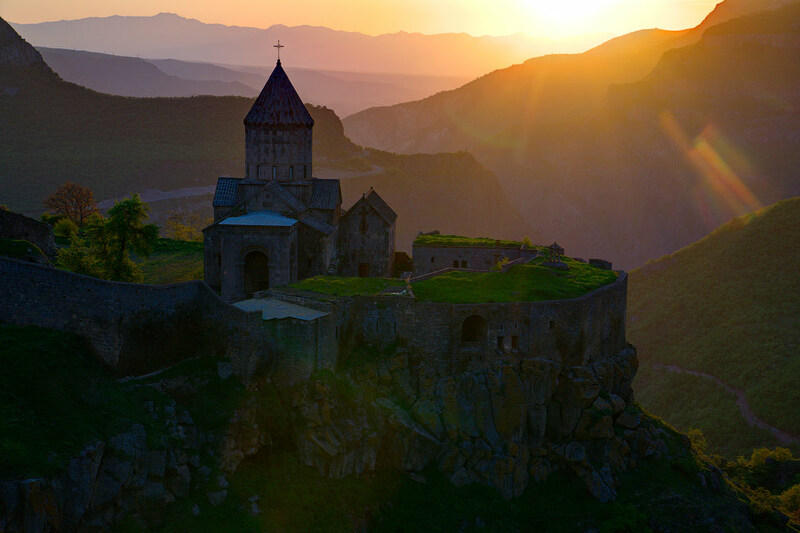 Having finished his work in Tatev Monastery the master asked the builders, who had crowded below, for two chips. After the builders had given them to him he kissed them and said, “Ogni surb ta tev”, which can be translated as “Let the Holy Spirit give me the wings”. Hardly had he finished speaking when two wings grew on his back and he flew away. And the monastery was called Tatev after the master whose appeal “Ogni surb ta tev” was heard by God. Once upon a time the builder who was constructing the monastery and the priest, who was busy making a canal so that the monastery could have a supply of water, had a bet on who would be the first to finish his work. A few days later the priest noticed that the master was about to finish his work and resorted to cunning. He draped the part of the canal which was not filled with water yet with a long white cloak so that fluttered by the wind it looked like a waterfall from afar. The trick did work: The master who was already laying the last stone turned back and saw the water falling down. He could not lose the bet and threw himself from the monastery wall. Later the stream was called the Priest Stream. In Syunik the snake has always been considered the protectress of a family hearth. The Armenians believe that there will be no happiness and peace in the family if someone kills a snake. Another legend has it that once a snake was scooped into the bucked together with the river water. The raven that nested in the monastery saw it, threw himself into the pail and pecked it. However the snake managed to bite the brave bird, and the thankful monks buried the raven on the way to the monetary. On the stepped pedestal near the southern wall of Church of St. Gregory there stands a 26.24 ft tall Gavazan Column (which means a staff in Armenian) crowned with a stone cross – khachkar. In old times the talented architect was able to construct this swinging stele. The stele can be put into motion by pushing. For centuries the mystery of this original seismograph that warned the monks about the cataclysm maturing in the Earth depths has remained unsolved. It is also said to have warned the people about enemy invasions. In this case it was put into motion by the warriors’ marching. The Arabs that conquered Tatev in the 10th century wanted to pull Gavazan down. Ten pairs of buffalos pulled the chains which the stele was tied with. But the chains were torn and the buffalos fell into the abyss. The invaders thought that it was a sky-sign and left the monastery. In the middle of the 20th century the architects made an attempt to unveil the mystery of the column. Unfortunately, after it Gavazan does not swing that fast. Excellent post ! I was born in Syuniq Region !